Why do we spend hundreds of hours playing games we don’t like? In this modern world of user reviews, a strange phenomenon has begun to occur. 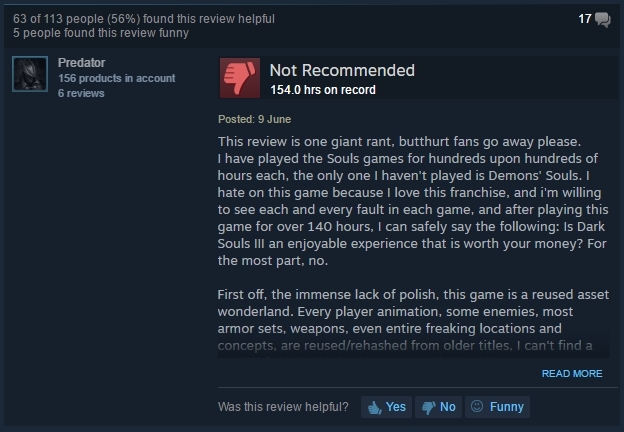 Check out the most damning, angry reviews of games on Steam and you’ll see that many of the users have played the title in question for hundreds, sometimes even thousands of hours. And the first question you have to ask is: why did they play the game for countless days when they hated it? Why not just play a good game instead? Playing a game you don’t like? Why not try one of the best PC games instead? Plagued by the question, I decided to gather thoughts from communities, colleagues, and even a psychologist. Perhaps inevitably, there’s no one true answer to the question. But there are suggestions that point to our identity as gamers and what is perhaps an ever-burning optimism that stands stoic behind our cynicism. I almost never play games for hundreds of hours, but there certainly have been cases where I’ve played for extended periods whilst actively knowing I’m not really enjoying it. Watch Dogs is a prime example, and I know I was playing it solely because it was the new big game, and there was no other major release to play at the time. There were a few interesting elements, but I was purely playing it for the sake of play. I owned it, and it filled the hours I dedicated to playing games. After 390 hours, this reviewer discovered The Division was far from the game they hoped it would be. Jordan raises a point during our discussion about input vs reward. “A lot of management games require a massive time input but give very little back,” he says. It’s a point that applies to management sims, but more notably to survival games: a lot of pressing E on trees for snail-like progress, with much of that progress obliterated if you die. It may take hundreds of hours for this cycle to eventually prove unsatisfactory for players. Alternatively, mashing E repeatedly to craft a spear for the thousandth time certainly passes the time. This reviewer took very little enjoyment from the 154 hours they spent with Dark Souls III. As you’d expect, this situation has been widely discussed on gaming forums. “People are seemingly obsessively playing games they strongly dislike. Why do people do it?” questions a poster on NeoGAF, beaming my own question out into the void. The replies offer a little more insight. 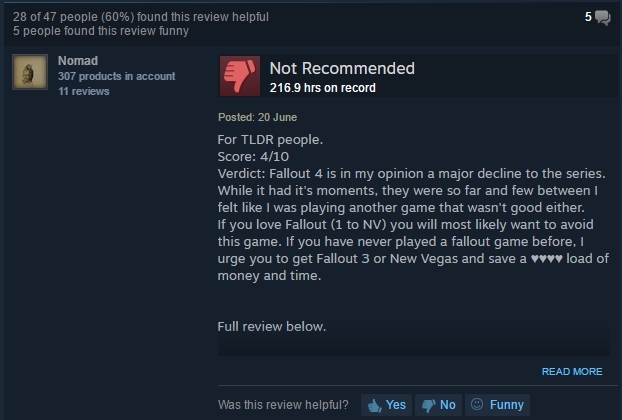 Despite thinking that Fallout 4 wasn’t good, this reviewer soldiered on for almost 217 hours. Diablo is a historic case of patch work changing its fate; when the auction house was removed and many gameplay changes applied, Diablo III was eventually embraced. But patching can also reverse the goodwill of gamers. The War Thunder 1.37 patch, which completely re-worked the unlock system, deeply upset many players. 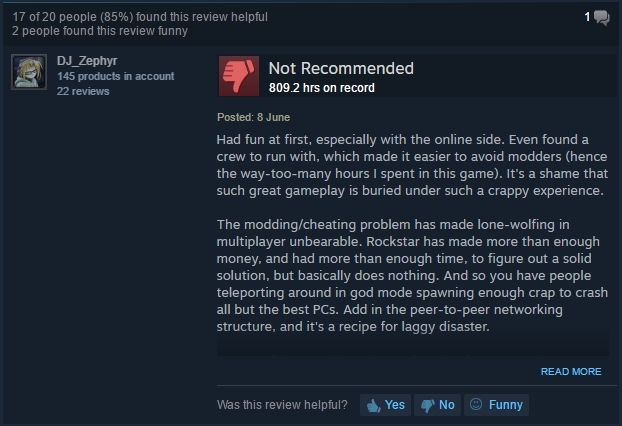 It resulted in a complete change of heart in Steam reviews, with players having clocked 200+ hours of gameplay suddenly filing deeply negative reviews. And as War Thunder progresses, that feeling of upset remains, notably in patch work that continually appears to emphasise the game’s apparent Russian bias. Not all Steam user reviews adequately explain why the terrible game in question kept them playing. In these situations I suspect it’s because the writer was probably having a good time, but one element irked them so much they decided that their 200 hours was a terrible experience. Part of the problem comes from hyperbole: there’s nothing understated about opinions on the internet. 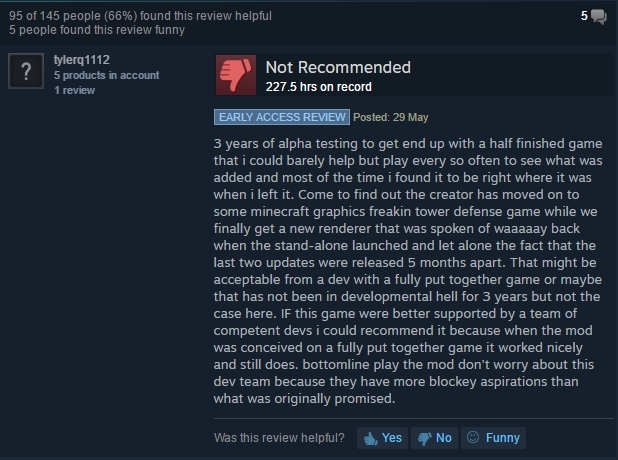 After 227 hours with DayZ’s alpha, this reviewer has had enough. There’s certainly correlation between the two mediums. For example, if you’re an avid viewer of superhero shows you’ve probably watched every episode of Arrow, even though the general consensus is that the series has been terrible since season 2. That’s 46 episodes watched with little sense of ‘true’ enjoyment. Kaye believes the root of the issue could lie in the gamer identity. “If you are a gamer who is invested in your ‘sport’, and self-identifies as such (I am a gamer, and this is important to me), then I can see how this may make you more likely to keep engaged as you may be willing to work through the bad times to fulfil a need which is inherent to your identity,” she explains. I feel this observation drills down into the individual communities. You could absolutely despise Blizzard’s direction with World of Warcraft, but if you’re part of the community you may feel a need and a duty to follow it through the ups and downs, even if it’s just to be on top of current affairs. This reviewer’s hatred of GTA V’s online issues didn’t stop them from playing for over 800 hours. Then there’s the social side. I played Dead Island to completion, and I believe it’s a truly hideous example of game design. But I played it in co-op, and while it’s true that playing with friends can make a bad game better, I know that I only kept playing because it was a conduit to spending online time with my friend. Community, be that a single friend or a hundred-strong guild, can keep us playing through the worst times. The games that see negative reviews from players with hundreds of hours played tend to have legacies; Fallout 4 and GTA V are from strong historic franchises, DayZ had amassed cult status on social media, while The Division emerged from years of ‘best game ever’ hype. They’re games that had dedicated players and communities before they even launched. And for those communities to continue, there’s an inherent need to keep playing. The correct answer to my question, then, is that there’s no real unifying theme, but almost certainly several camps of thought for each player. Perhaps you’re just an optimised with hope that the next hour will be better, or you’re part of a guild worth more than the gameplay changes you hate. But across all reasons, I suspect the underlying fact is that these games being reviewed are pretty good fun, even when they don’t meet expectations. What games have you played for hundred of hours even though you didn’t like it? Let us know why you endured them in the comments.